wList allows you to create a list of the files and subfolders of a given folder (also known as a directory). With one click, you can create a list of the contents of any CD-ROM, DVD, or USB flash drive, or any hard disk. You can easily search through or print this list. wList is easier than dir command (DOS). It supports file names which include Unicode characters. Easy, fast creation of file lists, which can be saved to a text file or the Windows clipboard. Searching for files of specific types (filtering), e.g. searching for music, pictures, documents, or films. It's possible to skip specified types of files. Access any file or containing folder directly from the list. Essential for finding the file(s) you want when you have a lot of them. How to search files from many CD/DVD discs at once? How to list all video files? From hidden or temporary folders also! You can print a directory list and use it - perhaps as a CD cover. How to make a CD cover with table of contents? Thanks to wList, you can easily document the contents of folders. You can make a list of files before archiving them. How to make a clickable file list? You can make a playlist and save it in M3U8 format. How to create a complete playlist of all of your MP3 files? With wList, you can make simple file lists from large, complicated folders in no time. Just choose the location holding all the files you want to list, and click the 'List' button. All national and international characters are saved correctly. wList has a very simple interface, and many carefully chosen features. Some examples: wList makes it easy to tell how large files are, or to select a default location to save your lists to. You can open any file from the list with wList: just double click on the filename to open and view the selected file. To open the folder containing this file, double click it while holding down the Ctrl key on your keyboard. You can control the style of your list. There are 10 premade styles (8 as flat lists, and 2 as hierarchical trees); it is also easy for users to configure custom styles. For example, you can choose whether the list should include the file sizes, and what criteria should be used to sort the file list. You can control the content of your list by choosing to skip certain types of files. You can choose to display only files, only folders, or both files and folders. Folders can be nested (having one folder inside another; this contained folder can also contain folders, etc). You can choose a maximum depth of nested folders to display, or to list everything. You can easily choose to list only files of certain types. There are 12 pre-defined filters available: JPG, MP3, archive files, audio, documents, executable files, pictures, music playlists, programming, text files, video files, and saved web pages. Users can easily add custom filters, which are flexibly configurable. The table below presents the default settings. You can define your own search criteria. Where on Earth are my MP3 music files?! With wList, you can create a list of all the MP3 songs on your hard disk or on a CD or DVD. To listen to any MP3 file on the list, just double-click it. wList allows you to immediately access the folders which contain the files you found. You can use this feature to help organize your music files. Aside from MP3 files, wList also indexes other popular types of sound files, such as WAV, WMA, and AAC files. Create a complete list of all of your music files! I remember that I have this picture.... somewhere?! It's often difficult to find the file you want on a CD or DVD. With wList, you no longer have to waste time browsing through various folders, looking for your pictures; you'll find your photos much faster. wList can easily create a list of all of the pictures on your disc, and of the folders that contain them. To view a picture, just double click on its name in the list. Aside from JPG pictures, wList indexes other popular graphics file formats, such as PNG, GIF, and BMP. Find all the photos you're looking for, whether they're on your old CD/DVD archive discs, on your USB pen drive or camera, or on your hard disk! wlist, file list, list files, dir, filelist, create file list, list of files, file lists, file listing, list directory, list folder, file search, find file, find files, search file, search files, directory lister, directory printer, folder printer, file list creator, Unicode. AAC: Advanced Audio Coding; a type of lossy audio compression, used for sound files - successor of the MP3 format. BMP: bitmap; a type of image file. CD: compact disc; sometimes redundantly called "CD disc". DVD: digital video disc; sometimes redundantly called "DVD disc". GIF: Graphics Interchange Format; a type of image file. JPEG: Joint Picture Experts Group; a format for storing pictures. It is frequently also called JPG, because of the historical 3-character limit on file extensions under Windows. 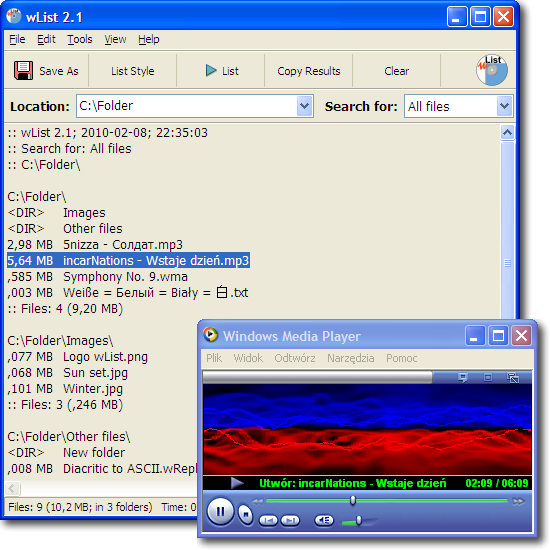 M3U File format that stores multimedia playlists. M3U8: The unicode version of M3U. When you save file list as m3u8, wList always save it as UTF-8 without BOM (Byte Order Mark). MP3: MPEG Layer 3; a type of lossy audio compression, used for sound files - usually music files. PNG: Portable Network Graphics; a type of image file. WAV: Waveform audio format; a lossless way to store audio. WMA: Windows Media Audio; another way to store sounds.